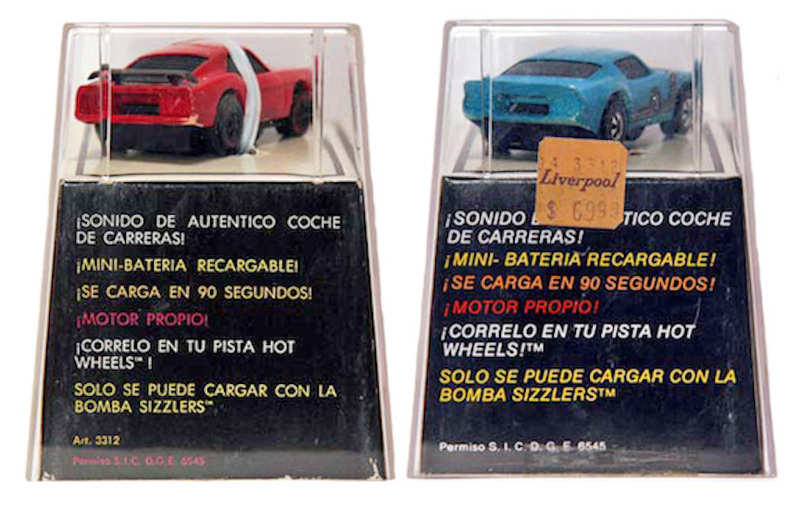 release their own version of Sizzlers until a year later and their production run appeared to have also paused with the 1973 model year. Night Ridin' Sizzlers line. 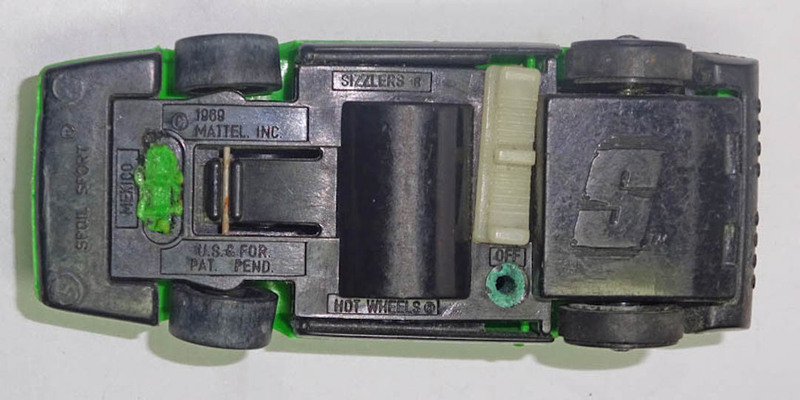 CIPSA also participated in that brief re-occurrence of Sizzlers with the release of several track sets in 1978.
battery on the chassis. 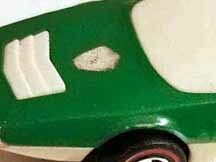 Available only in 1973, the six different Fat Daddys are characterized by the extra large rear wheels on a long battery chassis. counterparts in color and decor. Careful inspection reveals some differences also in the design of some of the chassis and wheels. 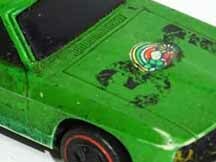 with each successive year showing and expanded line of cars, accessories and track sets. But the Angeleno M70 and the Ford Mk 4 can be see in conjunction with the artwork for two of the accessories, making four models for 1971.
expanded to two full pages in the catalog. 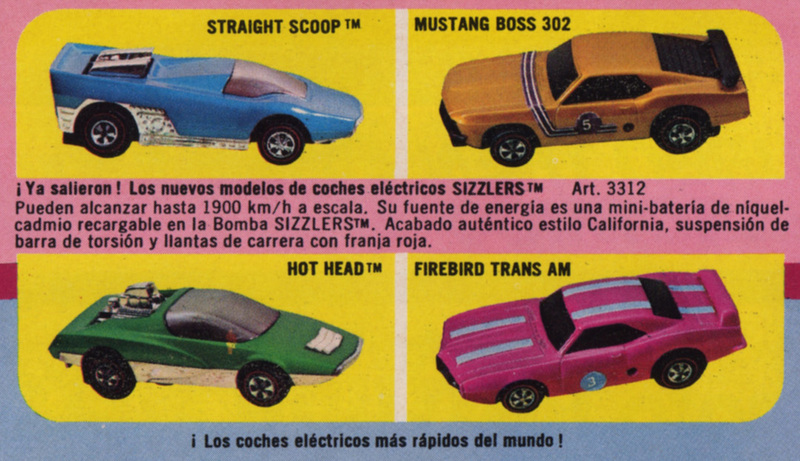 Four models were added to the line up for 1972.
at two full pages in the catalog. Four models were added to the line up for 1973, making the total og twelve different models. 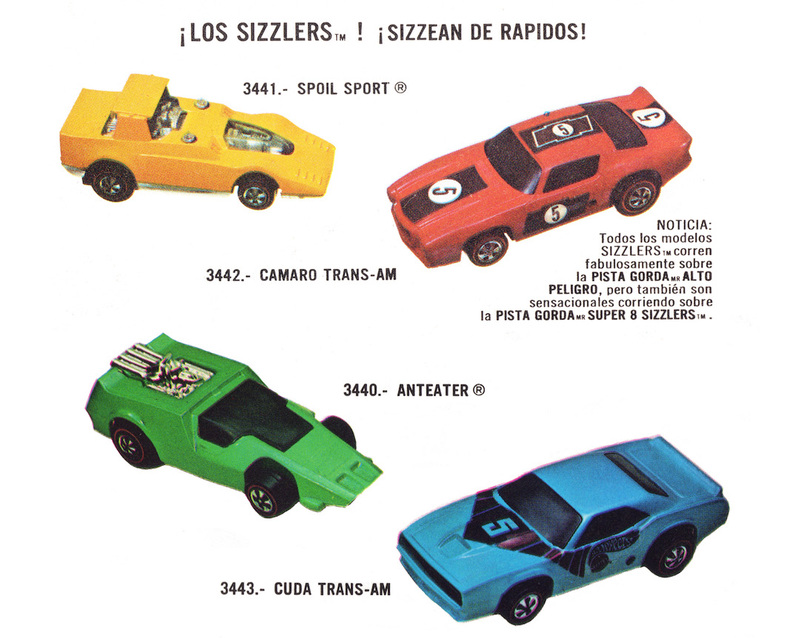 In 1978, CIPSA released at least four Sizzlers track sets. 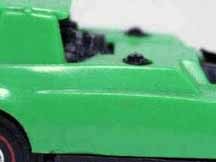 There is currently no evidence that any new models were sold with the track sets. 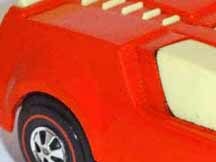 Sizzler cars came in track sets and also in clear plastic cubes. Two versions of the folded cardboard pedestal are known, both dated 1971. The two versions are very similar but there are minor variations in the text and graphics. The earlier one is labeled as Article No. 3312. 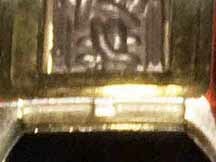 Rear panel of the two cubes styles. End panel showing Article 3312 on the earlier cube. CIPSA Sizzler came in a wide array of colors. 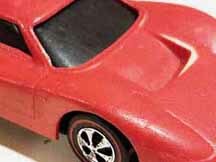 Some cars were painted but others are molded using a colored plastic. 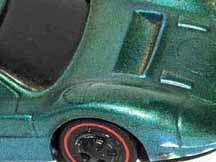 Painted cars have the most variety with use of metal flake and enamel colors. The table below is comprised of samples of each the 17 known CIPSA colors. 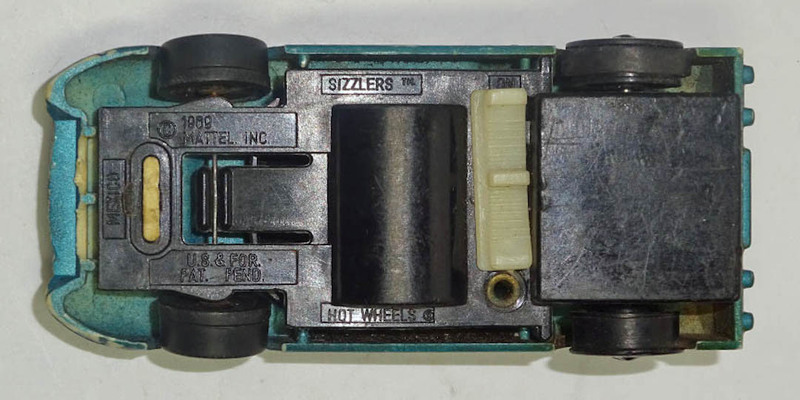 Four different chassis have been found on CIPSA Sizzlers. Two of them are identical to US normal releases. 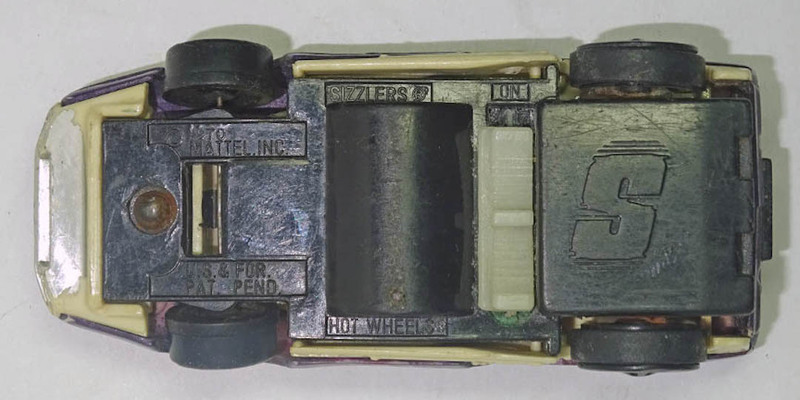 This chassis, dated 1969, is the same as the first release chassis in the US. 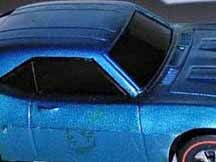 It is characterized by having no "S" on the engine compartment. The method for attachment of the chassis to the body is by melting a rectangular extension of the body through a rectangular slot. 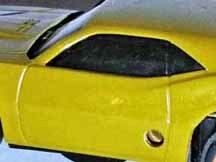 and the addition of two notches at the rear of the engine compartment to accept the lap counter antenna attachment. 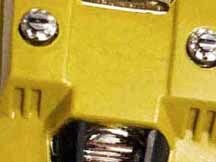 The attachment methodology is the same as the "No S" chassis using a rectangular extension and slot. 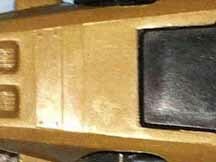 This chassis, dated 1970 is found only on CIPSA cars. 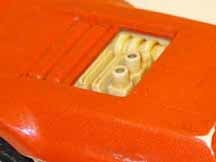 It is similar to the "S" chassis but the attachment method has been changed to a pin. The flexible tab suspension for the front axle has been removed and the area forward of the front wheels redesigned for the pin attachment. 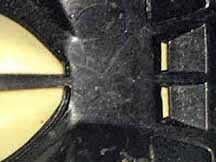 The "S" is preserved and the notches for the the lap counter attachment are still present. in the center of the rectangle to align the chassis with the pin hole. 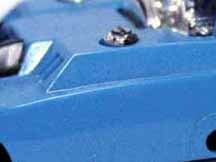 The front wheels on some CIPSA Sizzlers are different, using a through hole design vs. the normal capped style wheel. 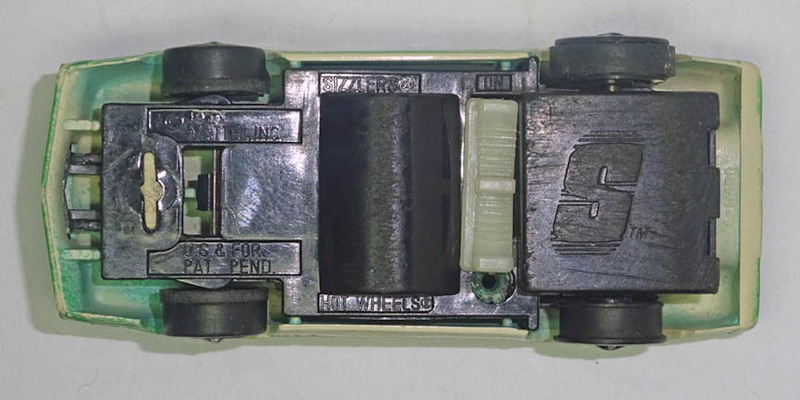 The Ford MkIV on the right has the normal two piece "capped" style wheel found on most all CIPSA and domestic Sizzlers. 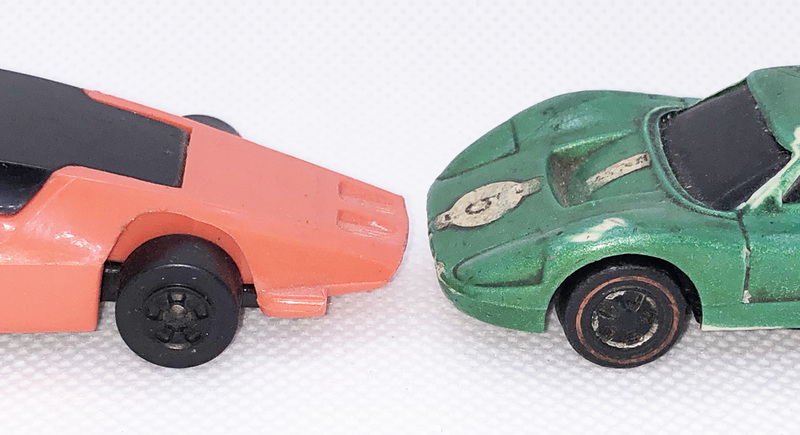 The Anteater on the left has a one piece "through hole" style wheel with no evidence of a red stripe. 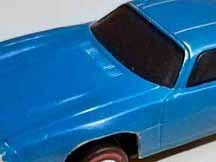 The Anteater model was released in 1973, the last of the three consecutive years of production. 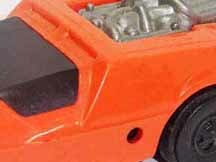 The chassis on the Anteater is a standard "1971 S Chassis". 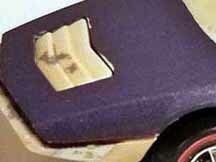 The car is sealed so the wheels are confirmed to be original to the car.